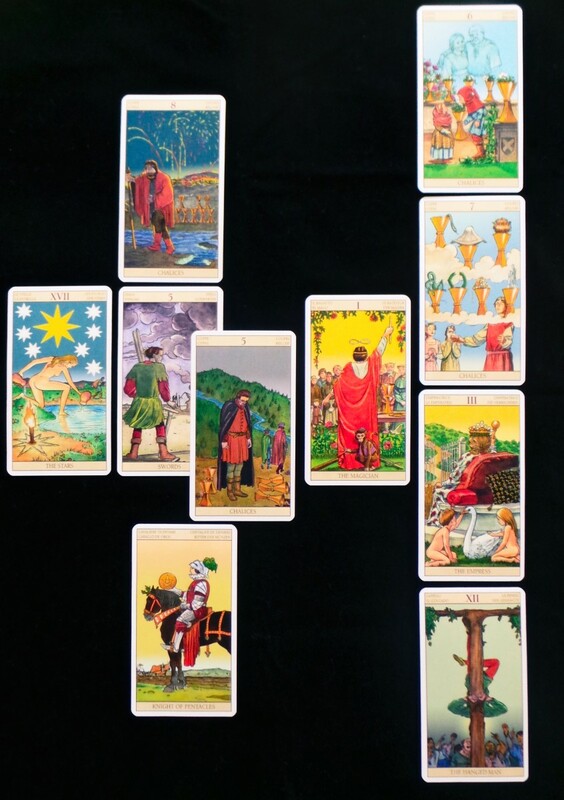 A spread in tarot is a layout, or the pattern in which the reader places the cards down on the table. 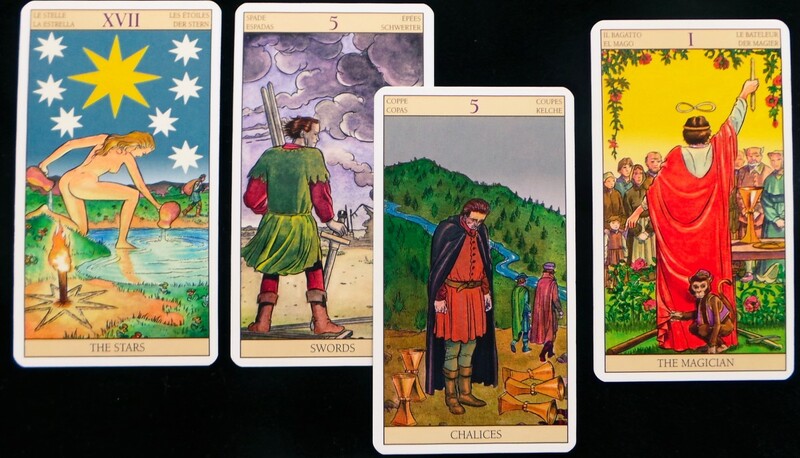 Each position in the spread has a meaning and modifies the card placed upon it. The Celtic Cross (CC) is the mostly widely known and possibly the most commonly used tarot spread. It is a little complex for an absolute beginner reader, but it is well worth taking the time to learn and assimilate it, as it may prove to be the only spread you need, apart from the essential one, two and three-card readings. The Celtic Cross was 'invented' by the famous occultist, AE Waite, creator of the Rider-Waite tarot deck. So it is a fairly modern device, although some practitioners will have you believe otherwise! It is thought that he based his famous tarot spread on a similar one used in Europe, although the origins of that one are lost in the mists of time. I like to use a Celtic Cross as the 'anchor' for my readings for clients. It is ideal for clarifying situations and evoking additional questions. It's important to not use it indiscriminately, for example, if reading for yourself, it is completely pointless doing a full-length CC reading on a daily basis. It makes much more sense to limit its use to once a month, or even less frequently. I have found over my many years of tarot reading that the information offered by a good, in-depth Celtic Cross can continue to unfold over 12 months or more. You probably have your own method of conducting your readings, and that's good. However, one thing I recommend before commencing is to explain to the client that this layout is ideal for interaction. I tell them I'm an intuitive reader, not a psychic or a charlatan who is looking for 'clues', and that they will get more from the reading if they participate. This breaks the ice and puts us both at ease. There is nothing worse than trying to read for someone who folds their arms in fear of 'giving something away'. I like my readings to be a two-way process. The first two cards of the spread are the most important part. In fact, tarot author, Sandra A. Thomson has a book based entirely on the first two cards of the Celtic Cross, The Heart of the Tarot. She holds that they are all you need to produce an insightful and useful reading. Her theory is that you have the situation and the problem, so therefore, you also have the solution or advice. She illustrates her ideas with many two-card combinations. The book is hard to get hold of these days so if you happen across a copy, grab it. The first card illustrates the main situation that faces the seeker. It can be something they are aware of, or possibly something they are oblivious to but will make its presence known pretty soon. If you can't immediately pinpoint the challenge, briefly use the card meaning to describe the sort of situation that card many represent and ask the client if it means anything to them. Usually, the circumstances become clearer as you progress through the reading. 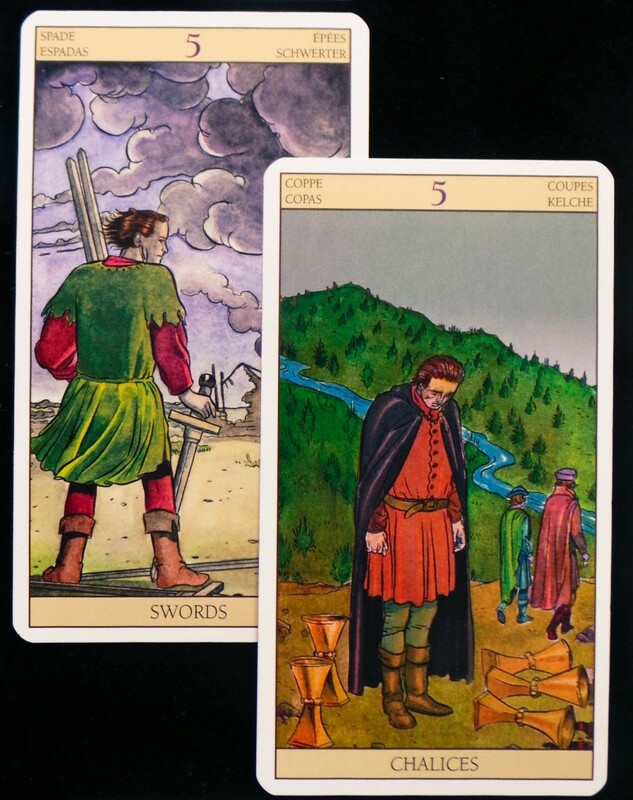 In our example, above, we see that the seeker is being challenged by a situation represented by the Five of Swords. Fives are always challenges in themselves and this one tends toward intellectual or communication problems. Here, we see that there is some dispute going on, or maybe the seeker is involved in a bullying campaign. The second usually indicates the obstacles or blocks to the resolution of the problem... and bear in mind that there is generally a 'problem' or the client wouldn't be wanting a reading in the first place. Often, this card represents another person or another person's wishes. For you, the reader, it is important to read these cards as a pair; almost as one card, if you like. Look at the images. Do they help or oppose? Is there a story there? Do they remind you of anything in your own life? Speak out, say what you see - remembering to be tactful and mindful of your client's sensibilities, of course. As you can see, these two cards can immediately clarify the situation, hence the idea that this, sometimes, is all the person needs. They can visualize their circumstances, as if from an objective standpoint. It is worth asking them, what advice they would offer to someone in the same situation. The 'aha!' moments that question provokes are priceless. In the example, the seeker is faced with the Five of Cups - an emotional challenge this time. 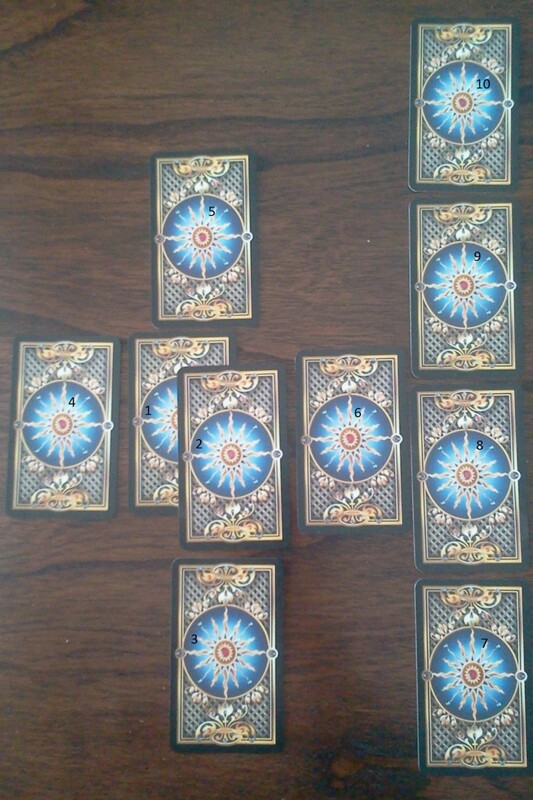 This indicates that whatever is shown in card one, has resulted in a loss or deep regret, and that it is this which is preventing the seeker from moving past the problem. Card Three is the base or root of the current situation. It can represent influences from the immediate past right back to childhood. I generally look to this card as the reason for the reading. Card Four is what is in the past or is in the present, but already receding. If there are negative cards in the reading, this is where I would prefer to see them. Card Five illustrates what the client is moving towards, or what the client sees as an outcome. I have heard this position called the 'hopes and fears' or 'alternative outcome' card. In other words, it shows the 'Law of Attraction' in action. Often what the querent believes will happen *will* happen. It is useful to read this as a pair with Card 10. Card Six is what is in the immediate future or is alreading moving into the present. Look closely at cards four, one, two and six. They represent a time-line. Take your time to re-examine them and try to pick up the thread of the story. Card Seven is important. It shows what influences the querent brings to the situation. It can represent their emotions, actions and opinions. Look at this card with the card in the third position and you will get a better picture of where the client is coming from. The two cards, together, will often tell you more than the client is letting on. Card Eight. The card in this position represents other people in the situation. Their influence, feelings and emotions. It could also represent a group or an institution. In other words, it is 'the other'. Look at this with Card 7 - see if there is a 'pushing against' going on. Two opposing forces, neither willing to concede their position. Don't forget that this can also be a helping position - the card may show someone who can help. Card Nine is often considered to be guidance or an alternative 'hopes and fears'. I like to think of it as the wildcard... and don't assign it a meaning until I see what card turns up here. It can be the pivotal card and give the answer to the problem. Card Ten is the outcome if everything stays the same. In other words, if the querent continues along the path without making a change. You can read this as a pair with Card Five; they will often portray the future with great accuracy. 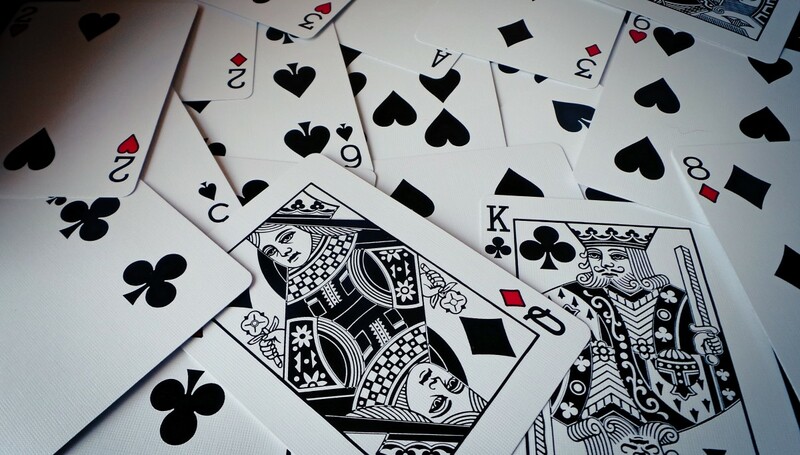 Once you have dealt with the cards in their logical order, read pairs and combinations where appropriate; turn your attention to the time-line indicated by cards four, one, two and six, as mentioned above. This can be quite revealing as you have a nice, neat little past, present, future spread right there. Card three is the recent past, one and two are the present situation, and card six is the near future. 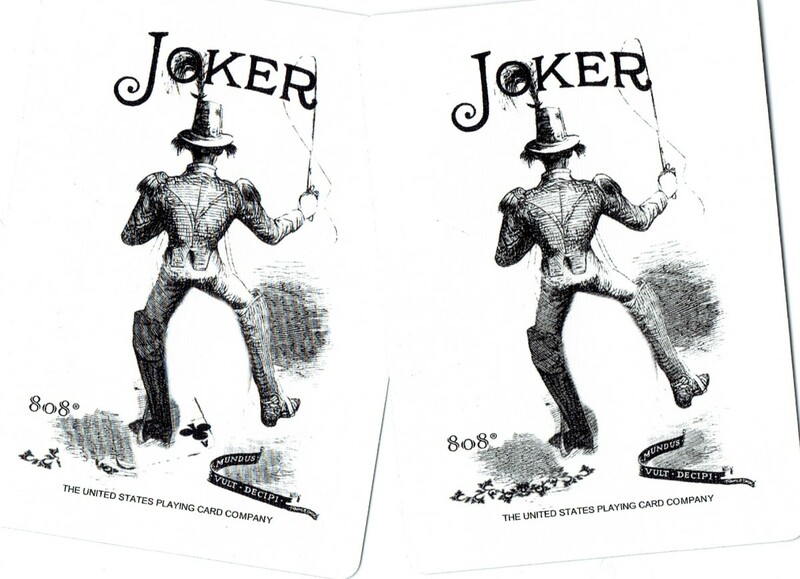 These cards can also be interpreted in an energetic way rather than as a fortune-telling manner. In this case, you would look at influences and energies that the seeker is leaving behind; influences and energies they are dealing with in the present and influences and energies moving toward them. Aren't you loving the flexibility of the Celtic Cross? 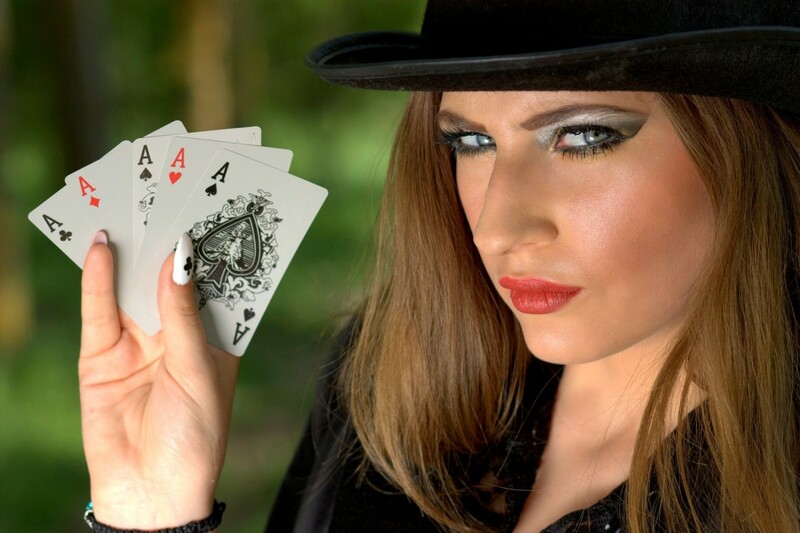 Some readers like to deal the cards face down and turn them over one by one. I find it far more useful to simply flip the cards down, face-up. I like to take a minute to absorb the overall flavor of the spread. You can get an immediate feel as to whether the reading is going to be 'up' or 'down'. In both cases, you must make sure that the reading and advice given leaves the client feeling uplifted, or at least more positive. I like to use the reading to get my client to take control and the cards are great at showing where they are letting things happen and where they can begin to make changes. Explain to the client that the reading points towards actions, events and situations that could unfold over several months. Offer them the chance to get back to you regarding this reading. It will help you tremendously if you take the time to note down the cards. Later you can add a brief synopsis of the reading you gave, important points that the client raised and any questions arising. Normally, a Celtic Cross takes me at least 45 minutes to go through. The remaining time is given over to one or two short readings to address questions that the client may have. 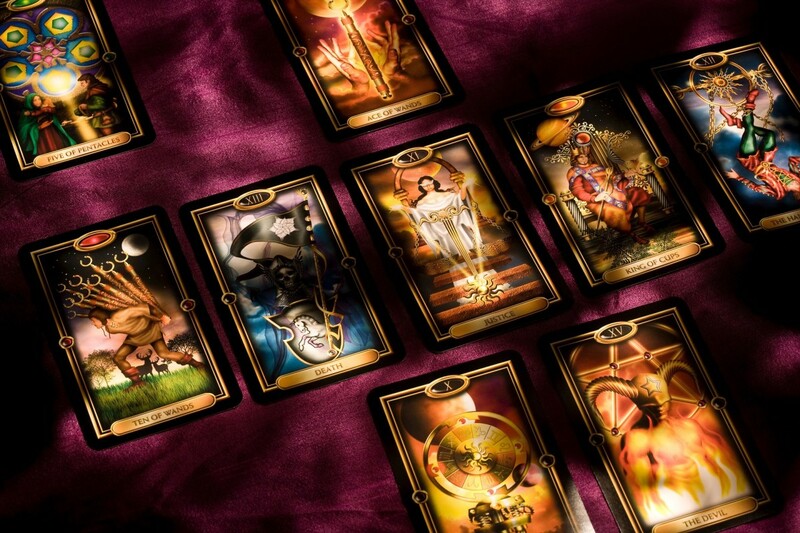 Warning: A tarot reading can help a client enormously, or it can harm them quite badly. Always choose your words with care and observe your client's reactions; adjust your approach accordingly. You could be forgiven for wondering how a clutch of cards with pictures on could help anyone with their love-life. Surely it isn't possible for someone to pull out tarot cards at random and expect any meaningful information to be delivered? 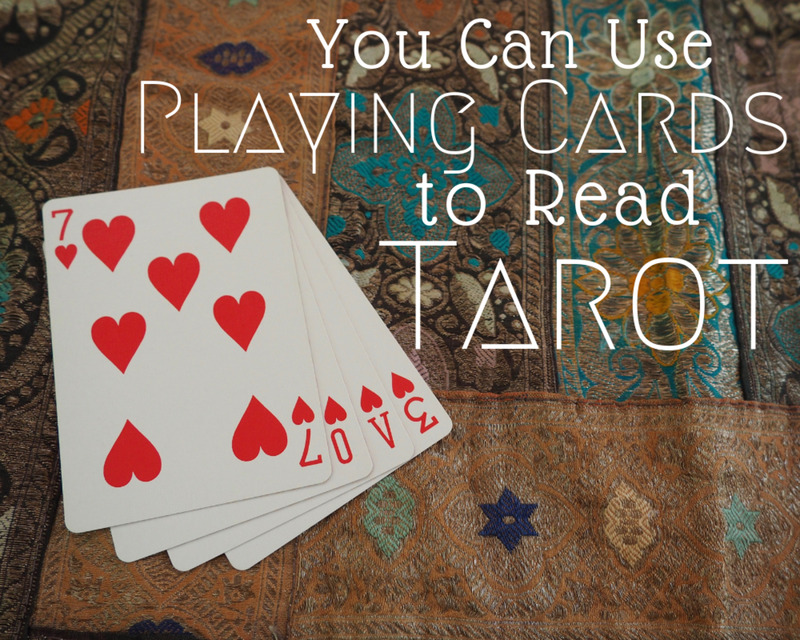 A simple, yet elegant, method of applying tarot card meanings to ordinary playing cards. Can I use the Celtic Cross spread with regular playing cards for a tarot reading? Yes you can, although the layers of meaning won't be so obvious. However, if you have a well-developed intuition, you'll pick up on the messages. Yes, been studying tarot for 16 years :) My kids are completely comfortable with their mother whipping out her tarot cards at any time. I won't read for them though. Thanks for stopping by, Jean. I've seen you on the forums, but didn't know you were a Tarot reader. Although my first love is Astrology, I often read at parties and out of local metaphysical stores. I liked what you said about the beginning of the reading. I always ask if the person has had a reading before. I don't read for anyone who is under 16 unless they grew up in a home like mine where there's always readings and astrology chart updates going on. I don't consider it "fortune telling" or "divination" either. Astrology I look at like a personality profile, and a tarot reading tells you what's going on or what may happen, but I always tell them they have free will. Ah... but you can use elements from it - such as cards 1 & 2 to show the issue or lay out the whole lot and just pick out the most significant ones. It is very accurate - these days I only ever use the CC or pairs or threes. Glad to help, Niko :) Thanks for your comment. This actually turned out to be more useful than some of the guides I've been reading online. Imagine that. 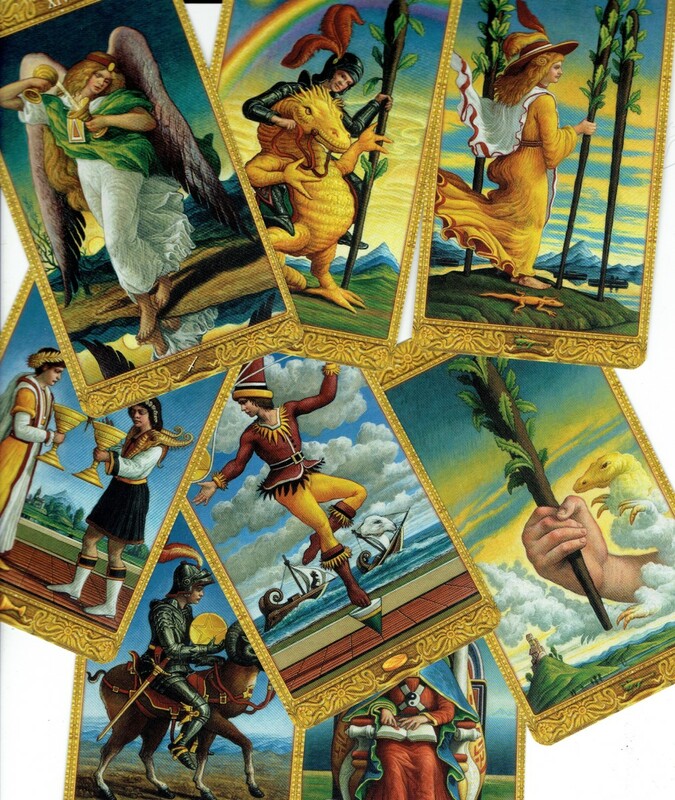 To answer your question, yes, sometimes Tarot readers do withold information, especially if they feel it would not benefit the client to become focused on something they probably couldn't do anything about. Having said this, there are often ways to prepare someone for a situation without being overly specific. Raggededge, when I once had a reading (which was an accident, really, since the anti-Christmas company I formerly worked for hired a Tarot reader for its Xmas party), the guy drew a "Justice" card and told me I would prevail. I have yet to know it that holds true. 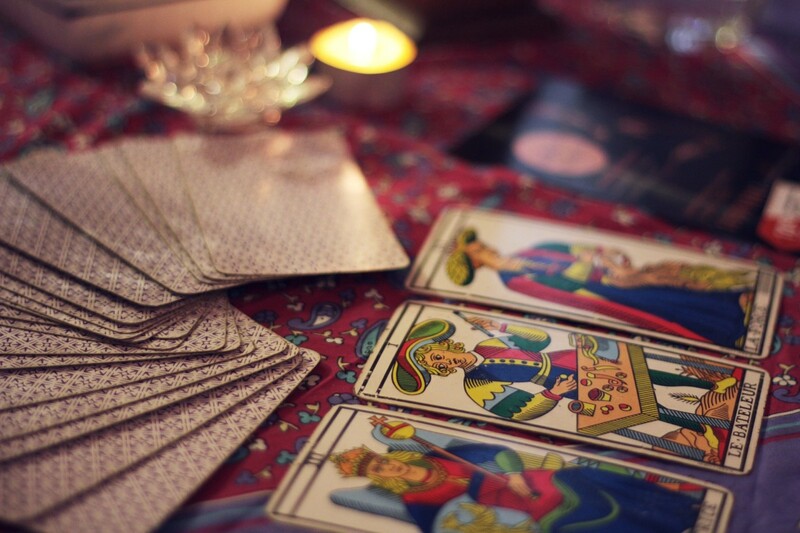 Do Tarot readers sometimes keep what they see from their clients? Wanted to say too this is a well written and informative hub. Good day.